though the basic concepts will apply elsewhere as well. Trees must be planted at the right depth if they are to establish themselves and flourish. Planting too deeply and under- and over-watering are the most common and serious planting errors. In well-drained soil you want to locate the topmost root in the root ball so that it will be level with the soil surface. The planting hole should be at least two times wider than the root ball. In poorly drained or compacted soil, take extra precautions to ensure that roots are not suffocated by the water saturation typical of these soils (see diagram). Loosening compacted soil before planting can dramatically increase the rate of root growth and root penetration into the soil. Establishment time is sped up, reducing the period of the tree’s vulnerability to pests, disease and drought. won't drain, you are going to have to add something more like normal soil to the planting area. Tamp the soil lightly, then settle the soil by watering the plant in. tree unnecessarily as it tends to prevent the normal increase of trunk caliper, resulting in an elongated, thin, weak trunk. Besides, it is not an aesthetically pleasing thing to see in your yard. trunk and stabilizes the tree. Less fertilizer more often is safer and also better for plant growth because you will lose less material due to water leaching. the ground. Thorough scattering of fertilizer is the best protection from burning. Standard fertilizers (as opposed to the slow-release type) are basically a mixture of different salts. Salts are ionic compounds that disassociate (dissolve) fairly easily in water. So, if these salts land on a wet leaf - and there is no way to avoid hitting some foliage in garden plantings - it will start to dissolve right on the surface of the leaf. A very high concentration of salt solution results, which can cause severe burning. The best thing to do is to fertilize when leaves are dry, then water thoroughly, wetting down the foliage to wash off any solid fertilizer. If you see residual fertilizer on the leaves, be sure to rinse it all off right away. Be especially careful about those areas found in many tropical plants where large upright leaves emerge from a stalk, as these can hold large amounts of fertilizer like little cups. Using an 8-3-9 or similar formula with the following minor elements: magnesium, manganese, boron, copper, zinc, iron and molybdenum are ideal. (The second number is usually lower in fertilizers designed for this area because phosphorus leaches away less rapidly than the other components.) We use this on all the plants in the ground except palms (8-4-12 with enhanced minors) and bananas (high potassium), which have special fertilizers specifically for those plants. There are also specialty fertilizers available for plants that require acid soil, such as gardenias. These fertilizers are generally named after the plant they are designed for. Many plants, especially tropicals like heliconias, will benefit from a foliar application of epsom salts (magnesium sulfate), especially at the start of the growing season. We use 1 tablespoon horticultural epsom salts per gallon of water and drench the foliage once a week or so after spring cleanup until the plants start to green up nicely. You will notice that every fertilizer we use has minors (also called micronutrients). These aren't needed in huge quantities but they are needed, or deficiency symptoms will develop. We also add minor elements to our container plants. In this area it is also recommended to use a micronutrient foliar spray twice a year. Fruit trees especially will benefit from this as well as the application of chelated iron (such as Sequestrene 138 or Microlific Iron EDDHA) dissolved in water and applied at the root crown two or three times a year. Non-chelated commercial iron additives don't work well in our alkaline soil. to possible extreme cold snaps during this time. When Trees die, blame is often placed on pests, disease, the method by which they were produced or the plants themselves. The truth is that many trees die from too little or too much watering during the first few months after planting. Trees are likely to get too little water in well-drained soil and too much in soil that is partly drained. 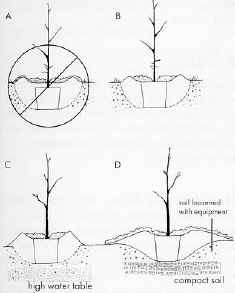 Ideal irrigation schedule for quickly establishing trees in well-drained sites: Daily for 2 months, then 3 times a week for 3 months, then weekly until established. Good luck on growing a health tree or shrub.